Why the difference between those two words is so important to the future of our economy. There are, indeed, obvious differences between the current downturn and the Great Depression. 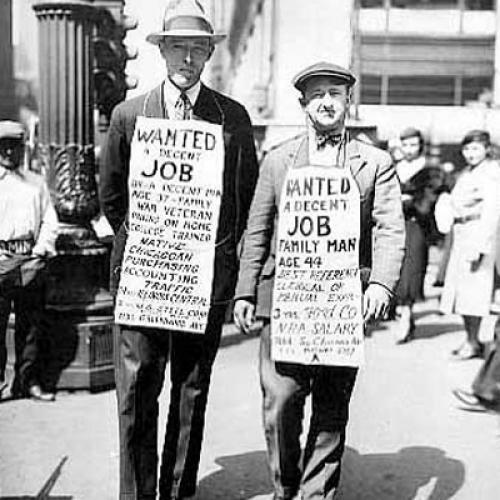 The unemployment rate, for one thing, was much higher in the Great Depression. But for the purpose of deciding what to do next, the term “Great Recession” is deeply misleading, and has led to a continued underestimation of the challenges facing the United States and the world. In its basic contours, the current downturn is much more similar to the depressions of the 1890s and the 1930s than to the post-World War II recessions. Until our policymakers in the White House and on Capitol Hill acknowledge this, and convey the depth of the crisis to the public, it is going to be very difficult to get out of the economic hole in which we find ourselves. 1) The Financial Crisis: The downturns of 1893, 1929, and 2007-8 were precipitated, and deepened, by a financial crisis. In 1893, gold outflows resulting from a downturn in Europe (in the 1890s, London was the center of world finance) caused deflation and a spate of bank runs. In 1929, it was the stock market crash, and in 2007-8, the subprime mortgage crisis. 2) Overcapacity in a Leading Industry: After the Civil War, railway construction had driven the development of capital goods industries. In the years before 1893, it started to slack off, leading to a slowdown in private investment. Before 1929, the production of automobiles and streetcars tapered off, and before 2007, the growth of computer/telecommunications/Internet industries began to slow, along with construction, housing, and auto sales. 3) The Global Dimension: During recessions, a downturn in one country has been eased by prosperity in another, but in depressions, the downturns have been global. During the early 1890s, the downturn spread from Europe to the United States; in the 1930s and late 2000s, it spread from the United States to Europe and Asia. Each of these features contributes to the most salient feature of depressions: their sheer length and intractability. Overcapacity in leading industries and the growth of indebtedness discourage consumption and investment; global instability holds back trade. The recovery of the private sector is slow and tortuous, and an increase in employment must be achieved primarily through public investment. During the Great Depression, new private investment in factories and offices did not rise to the level of the 1920s until 1946. Until then, whatever growth in employment occurred was largely the result of public investment. Since World War II, policymakers have used the automatic stabilizers built into the federal budget (for instance, unemployment insurance) and the Federal Reserve’s power over interest rates and the money supply to ease the country out of recessions. The success of these efforts even led Fed and Treasury officials during the late 1990s to believe that the United States had finally conquered the business cycle. But depressions have proven much more difficult to counter with federal policies. To get out of a depression, a country’s consumers and businesses must pay down the debts they have accrued. Only then can demand for consumer and capital goods pick up. Government can, however, accelerate this process through public subsidies to individuals, businesses, and banks, and through jobs programs. If government decides not to stimulate spending and demand, as occurred in the United States in 1938 or in Japan in 1998, it can cause a regression in the recovery and prolong the process over a decade. Countries also get out of depressions by developing new leading industries and outlets for investment. After the Depression of the 1890s, the U.S. enjoyed a boom in the production of cars, streetcars, and telephones and in the development of electrical power. The U.S. got out of the Great Depression because of World War II and the subsequent growth of an automobile/suburban/interstate highway industrial complex. And as some countries have recovered earlier than others, they have given the impetus for a global recovery. The United States did this after World War II. In addition, reforms to national and international financial systems have prevented the re-emergence of instability and uncertainty. The Federal Reserve System came out of the Depression of the 1890s and Bretton Woods out of the Great Depression. In each of these instances, government has played a major role in creating the conditions for reviving the economy. It has reformed the financial sector, eased the burden of debt, fuelled private demand, subsidized new industries, and negotiated needed changes in the global economic system. Without a huge and active governmental role from the United States, much of the world economy could never have enjoyed the kind of prosperity it did after the Great Depression and World War II. The White House and Treasury have tried to address the causes of the current downturn, but their efforts seem to be falling short. The administration’s stimulus bill and recent aid to states has created jobs, but not enough to stem the rise in unemployment. Congress passed financial reforms that could eliminate the worst excesses of the recent housing bust, but many of the critical details in their reforms have been left up to the Secretary of Treasury and the chairman of the Federal Reserve, who, if hostile to regulation, could subvert the reforms. And as Fred Block and Matthew Keller document in a new book, State of Innovation: the U.S. Government’s Role in Technology Development, the Obama administration has spent billions of dollars trying to inspire a high-tech green economy. But as Jonathan Alter recounts in his book, The Promise, Obama couldn’t entirely follow-through: He wanted to include sizeable funding for a national electronic smart grid in his stimulus plan, but was discouraged from doing so by the web of different state regulations that would have delayed its construction. The administration has also attempted periodically to address the imbalances in the international economic system. They have jawboned China, whose growth could pull the global economy out of its doldrums, to revalue its currency to encourage imports. But the Obama administration has stopped short of declaring China a currency manipulator, and the Chinese have largely ignored Washington’s tepid complaints. The Obama administration has also continued to pursue an aggressive overseas military policy, which—whatever its geopolitical merits—has widened the country’s balance of payments’ deficit. The administration’s hesitancy to move forward in spurring domestic demand, subsidizing new industries, and reforming the international financial system has had much to do with politics. The depressions of the 1890s and the 1930s spawned left-wing movements that demanded stronger government action. This depression has fuelled a right-wing populist movement that opposes government spending. The Democrats and the Obama administration have not been able to counter this movement. As a result, the country has been caught in a dangerous political-economic spiral, as the failure of spending to halt the rise in unemployment has fueled right-wing arguments against any spending, which, if heeded, will result in even sharper increases in unemployment. To be sure, the United States will eventually extricate itself from this depression. But the question is on what terms. If the Republicans are taken at their word, they will block further spending programs, which will delay the recovery and hamper or altogether impede the transition to new industries. If they gain power—through winning one or both houses of Congress and the presidency—they could be expected to gut financial reform and favor older extractive (and environmentally disastrous) industries over new green ones. Unemployment would linger at seven or eight percent, and the U.S. would find itself increasingly at the mercy of its Asian creditors. Yes, the United States would eventually enjoy modest growth, but not the kind of buoyant and progressive prosperity its citizens once enjoyed.